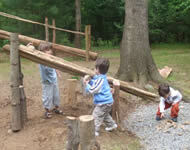 Aspetuck Land Trust has built the areas first hands-on natural playground at our Leonard Schine Arboretum in Westport! Officially open on June 12th, 2010 the playground, designed for children ages 3-7 and built with natural materials found on the preserve, was inspired by a similar playground at the Minnesota Landscape Arboretum. It comprises approximately 10,000 square feet in a meadow and has areas for fort building, digging, tea-parties, tower-climbing, trail-walking, stick-stacking, nature collages and more! There is even an elvin village where younger visitors can play with pine cone dolls, honing both their imaginations and their fine motor skills. This is a great place to meet for a play date or to bring the grand children! The Natural Playground was voted one of the Top 50 Playgrounds in the U.S. by Early Childhood Education Zone. All of the play areas have been constructed out of natural materials, primarily red cedar, found natively in the Leonard Schine Preserve, and sticks, logs, saplings, pine cones and acorns collected by a volunteer corps made up of Land Trust members and volunteers. Thank you to all the volunteers who built this amazing place through which children and parents will explore nature for years to come. For more information about the preserve and a detailed map, CLICK HERE.